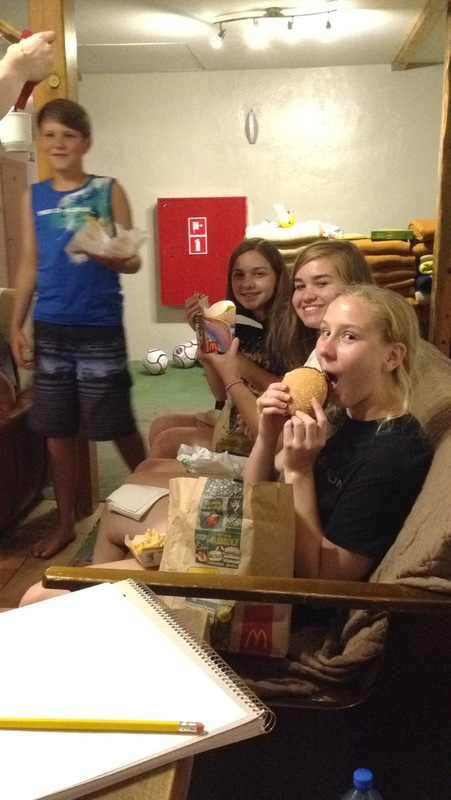 The youth on our team made a surprise trip to McDonalds tonight courtesy of some of the Polish leaders. They called it our “top secret” mission of the day. It’s Thursday, almost the last day of camp. Everyone is getting tired from the heat, the sports, lack of sleep, and just plain overall fun. Some of us adults from Pender are really feeling our muscles (I may think I’m still able to play flag football and throw a softball, but my body thinks otherwise!). It was a little difficult getting the campers motivated to continue with the individual sporting activities today, but Colleen managed to get spirits and bodies moving with a couple of warm up dances. As the songs began, campers started migrating out of their cabins and onto the ‘dance floor’ (the driveway!). With plenty of water breaks, and campers migrating between their chosen sport and the climbing wall, we made it through the two sessions. It wasn’t long before someone ‘threw a grenade’ (something the Polish leaders drummed up for a little added fun for the campers – one of the leaders yells ‘grenade’ and everyone is supposed to fall to the ground; if you’re left standing, then you are thrown into the lake and possibly rolled in the sand; as not all campers were at the morning meeting the other day to hear this explanation, then they were fair game for being left standing). Two campers and one of our own (Phillip Helms) were the unlucky ones to be thrown into the lake today. After an afternoon of free time and resting, a ‘building bridge’ activity began in the crafts room. Each cabin (there are four) was to build a bridge out of popsicle sticks and hot glue. The bridge had to be at least one stick high, 3 feet long, and constructed within 30 minutes. It was fun to watch how they worked together (after a little squabbling) to build their bridges; some strong, some weak, some a bit rickety looking. After dinner we held the competition – to see how many bibles the bridge could hold before breaking (or the bibles fell off). The campers had a great time watching the competition and the winning bridge managed to hold 17 bibles! We ended the day with a worship service that started out very energetic with singing and dancing to praise songs followed by a visual presentation by Sergus and Marek explaining how to receive God’s light and how it will always be with you no matter what may happen in your life. They asked for anyone to speak about how God’s light has affected their life and three campers came forward to share. Everyone lit a candle and laid it around the large cross that had been placed on the floor for a beautiful, peaceful presentation of God’s light. I have truly enjoyed watching the campers make new friends and become comfortable enough around we Americans to share about their lives. Collin and Ben A. have bonded with some of the younger boys as they are always climbing all over them (literally), playing soccer, and having all around fun times. It’s going to be hard saying goodbye to them all on Saturday. To believe in God with your mind is not enough. You conciously need to enter into a relationship with God spending time in God’s word and prayer. Today’s devotion was on disipleship. Our team focused on the 12 disciples and what we could learn from these ordinary men who through the power of the holy spirit did extraordinary things. Jesus spent a lot of time in prayer before choosing the 12 disciples. John 6:70, “did I not choose all of you’re my 12” His minstry was based on his selection, there was no Plan B. Our devotion went through each of the 12 disciples from Peter to Judas often providing new insights to our own Pender diciples here in Poland. At Worship service that evening we decided to do a skit where our youth participated in a game to see who was paying attention about the 12 disciple facts we went over in the morning. Three teams, Team “NOAH competition (becausae we have no competition), “JOB Well Done” and ROOFKIE (Ant in Polish) had to pop a balloon to be the first to answer the question. Lets just say our youth must have been a little tired in the morning. Below are the quiz questions, do you know your 12 disciples? And no Ben, Nathanial was not the overly logical thinker. Paastor Z… gave a sermon on never stop dreaming and being a learner. Our master and teacher in heaven has a plan for us and wants us to actively seek him first. End of the service was filled with dancing and singing followed by a late night NED vs ARG soccer match. 1. What disciple was known as “the rock” and was always asking Jesus questions? 2. Who told his brother “we have found the Messiah” and brought him to Jesus? 3. Name the two sets of brothers that were disciples. 4. What was James’ and John’s nicknames and why? 5. Which disciple was a rational thinker? 6. What did Jesus want Phillip to do? 7. What disciple was also known as Bartholomew? 8. What was Thomas’ nickname? 9. Why did Thomas not believe that the other disciples had seen Jesus after the tomb had been found empty? 10. Which disciple was a tax collector? 11. Which disciple may have been a “backstabber” or terrorist? 12. Which disciples nickname was “the less” or the younger? 13. Which disciple wrote the book of Jude? 14. Which disciple made many mistakes and was always listed last in the Bible? 15. What was Judas’ biggest mistake? Hello, I am pastor – z. That is so good to have a wonderful people from Pender UMC on the sports camp. Since the first time when they came it is my strong remaining and missing for your wonderful church. I miss some people who are very special for us who were working with us in past years like Stan Kurzeja, pastor Kenny Newsome, Tim Lyberger, Mery Beryl, Sarah Hocker, Lesia and Mark Reese, David Shuping, Mike Dingman and many, many others. I want to tell you that the camp is going well and we are so grateful for everyone who was helping us in your many ways. Blessings in Christ – our Savior and Shepard. English lessons were full of fun today! Ms. Laura started the group with a game where the youth, campers and Pender youth, were interspersed in the circle. Each youth was asked to pass a “Goofy” doll around the circle and as they took possession of the doll, they needed to provide an English word for categories such as: colors, animals, favorite sport, clothing. The campers and the youth had a great time with the answers and the game was a complete success. Once the game was over, the students moved around tables and played a scrabble like card game which allowed the Polish campers to build words from a base word that the group picked. The Pender youth had a great time playing and coaching the campers through the game. Many of the groups completed the game and ran through the game multiple times. In the middle of this game with the boys group it began to rain dramatically. Torrents of water fell, lightning flashed, hail fell and the world became very wet! Despite the wild storm, the youth stayed focused on the game. The girls scampered in from the gazebo during the storm where they were working on crafts. They hung out in the room until it was their turn for English! I can hardly wait to see what she will come up with tomorrow! The youth (Pender and campers alike) loved the English! Today was a super hot day with a nice refreshing breeze in the afternoon. We decided to let the youth campers make their craft outside under the big gazebo. The camp theme for the day was: God has a plan. He wants us to use the talents and gifts he has given us. We have four groups of campers, each sharing a cabin together. The craft for today was designing and decorating a team banner. It was great and quite interesting to watch each group discuss, plan and decorate their big fabric piece in front of them. The two girls teams were first and almost done when it started to rain a little. “Oh, it won’t rain much”, we thought, “ let’s just finish up and leave it to dry.” In less then a minute it literally poured buckets and the wind blew so hard that the rain came in sideways. Some of the girls ran out to get shelter in the cabins and the rest of us huddled closer together to be more protected from the heavy rain. We screamed and laughed at the same time as the strong rain soaked us more and more. The rain turned into hail and we couldn’t believe how fast the beautifully decorated banners just washed and floated away. Now that we were soaked to the bones already it didn’t matter anymore so we just ran through the big puddles to the main house. The boys teams made their banners inside after the storm had passed and the girls will decide tomorrow if they like to make a new one or use their washed ones and renew them. Last night at worship service the American team had a chance to showcase our beautiful singing voices. We sounded like a thousand angels singing their hearts out. The Polish children couldn’t help but weep tears of joy. In reality, we made a joyful noise and the campers loved clapping and dancing along with us. We sang 10,000 Reasons, Blessed Be Your Name, and Days of Elijah. The motions to Days of Elijah were a big hit and I have a feeling that will become a regular song in our nightly worship services. Lisa and Robert did an amazing job leading us on the piano and guitar! Ben W. gave a short sermon on the scriptures we were focusing on yesterday (Jeremiah 29:11-13 and John 15:16). He explained the context of the verses in Jeremiah and gave the campers a further explanation of the passage than they got in their morning devotional with their cabin. The theme for yesterday was “God has a plan”. Today the theme is “God calls us to liberty”. We kicked off our day with a devotional provided by Tanja and Phillip. Our first sports session begins in just a few minutes. Prayers for a safe and fun-filled day are appreciated!